Just in time for the premiere of Solo: A Star Wars Story, Ugg (a division of Deckers Brands) launches the fourth iteration of its Star Wars collaboration with a limited-edition collection (SRP $130 to $180) of boots for men, kid’s and toddlers. Inspired by the Millennium Falcon, the fastest ship in the galaxy, the capsule fuses Ugg’s best-selling Neumel chukka boot with details from the iconic spaceship. 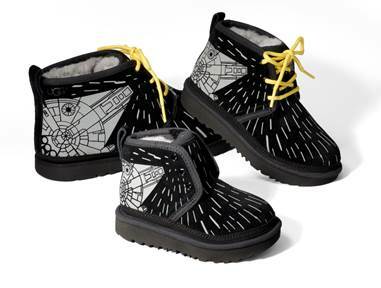 Boasting Ugg’s athletic-inspired Treadlite sole that’s lightweight, durable and comfortable, young and young-at-heart Star Wars fans will be ready for adventure—perhaps even in a galaxy far, far away. Rounding out the package for avid Star Wars fan is tissue paper that showcases artwork and images from the original film and comic book storyboard and a custom Star Wars by Ugg box. With a limited supply of 500 units per style, the collection is exclusively sold at Ugg.com and select North American flagship locations.